Diffusion panel, emitting soft light without ghost, glare or flicker. The Ra85 high CRI LED, provides lighting close to daylight. Simply touch the icon to adjust brightness as you will. 90pcs of LED bulbs ensures 50000 lifespan, in next 25 years, no bulb changing troubles anymore. 180°swivel lamp head, 16.3+16.3 inches adjustable metal arm, rotatable body. Strong clamp supports up to 2.36 inches tabletop. 12-month warranty, friendly and easy-to-reach support. To use the lamp on an inclined table or to fully secure the arm, please use a screwdriver to fully lock the screw on the clamp. 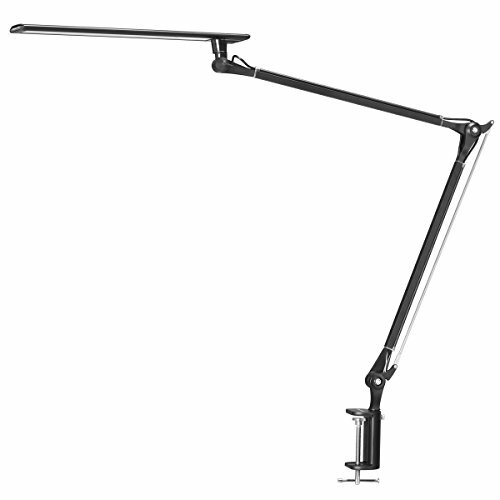 Highly Adjustable - 180°swivel lamp head,16.3+16.3 inches adjustable metal arm, rotatable body. Strong clamp supports up to 2.36 inches tabletop. Longevity & Energy Saving - 50000 hours lifespan, no bulb changing troubles in the next 25 years. 20% energy consumption as a incandescent bulb does.